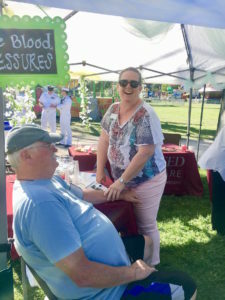 Advanced Health Care, a long-time locally owned and operated agency, provides services ranging from companionship and transportation to more complex needs such as memory or end of life care. Every client with Advanced Health Care requires individualized care and consideration. To optimize each client’s care plan, it is assessed and formulated by a nurse. This provides clear directions for the care providers who attend to the client. In turn, care providers keep up with chart notes. This keeps track of all activities and treatments. Ongoing visits by the nurses are conducted on a regular basis. Julie Ferguson, Administrator and Co-Owner, has known each member of her team for years. The bonds between the nurses have grown through the years. Every Monday morning they meet to talk about new clients and interesting challenges. Sharla Bode, the V.P. of Clinical Operations, appreciates the wealth of experience in the room, which empowers the group to resolve issues, talk about strategies and handle whatever comes up in a timely manner. Sharla is also one of the RNs. Her parents started the business over three decades ago and she is proud to continue the family tradition. Previously, Sharla worked in acute care in a hospital and now loves the shift of being able to see clients in their own home atmosphere. It provides an opportunity to get to know the whole family. She sees one of the nurse’s roles as guiding people with their care decisions. These could be things such as deciding when more care is needed or providing encouragement with treatments. It might be about looking at an appropriate time to go to the hospital. “It’s something different every day,” Sharla said, and is another reason why she is so engaged with her work. “I so appreciate the integrity of this company,” explains Maggie Shannon. She remembers her early experiences noting how thoroughly the care was given. She explained that there have been many changes in health care over the years, but Advanced Health Care has kept the focus on the client and the people who work with them. “I love the clients,” she smiles. Most of AHC’s clients are the elderly , and that includes many veterans. Clients do, however, range in age. Maggie works part time, giving her the chance to pursue other interests. “It’s wonderful to work for a company like this,” she added. Debra Jones was a school nurse and also worked in operating rooms. She started with Advanced Health Care as a field nurse and later moved into a case manager position. Even after all the years in nursing, Debra said that the work provides new challenges. She is a proponent of communication skills, which are critical to seamless care. Every client has a notebook at home to keep track of what has been done and what needs to be done. All the nurses agreed that this work can be an emotional roller coaster. On a single day situations from one home to the next will vary sharply. It keeps life stimulating, and the group support makes all the difference. The nurses take turns being on call so that one is always available 24/7 for the employees and clients. Before starting at Advanced Health Care, Judy Datsko was a hospice nurse and a teacher. She works three days a week so that she can spend time with her grandchild. The flexibility really works for her life now. “I’ll do anything to support our staff,” said Julie, who works tirelessly with the nurses to create a schedule that meets their various needs. Judy pointed out that such a positive working environment is not always the case in the industry. Julie Chase has been a nurse for more than 40 years. 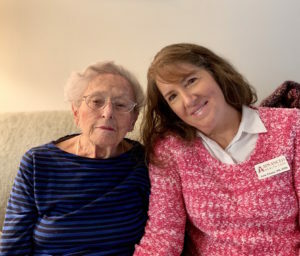 After many years working in a nursing home facility, she was delighted to find that home care could be a “gift of independence.” She saw how a small amount of home care for a senior as they age could provide the help needed to stay home safely. This holiday season you may visit a relative and notice that Dad has lost weight or Aunt Sue isn’t keeping the house as clean as it used to be. These may be signs that outside help is needed. Sometimes people need care suddenly and other times the needs grows over time. It may start simply with transportation to an appointment or a once a week service with household chores. Advanced Health Care will help you identify the needs and steps to take. “When you have your best day, your client has their best day,” said Debra who appreciates the connections she has with clients and co-workers. If you would like to talk with someone about your home care needs, please call 800.690.3330 or visit the Advanced Health Care website.